January 30, 2019, © Leeham News: We started an analysis of the Boeing 777X last week as its rollout and first flight should happen this spring/summer. In the Figure below, the first flight test aircraft has its engine mounted, before roll out. We will spend this article on the 777X engines, the GE9X from GE Aviation. Surprisingly, these are less powerful than the GE90 engines on the Boeing 777-300ER, the aircraft the 777X is derived from, despite the 777-9 being larger and heavier than the -300ER. This is with intent. 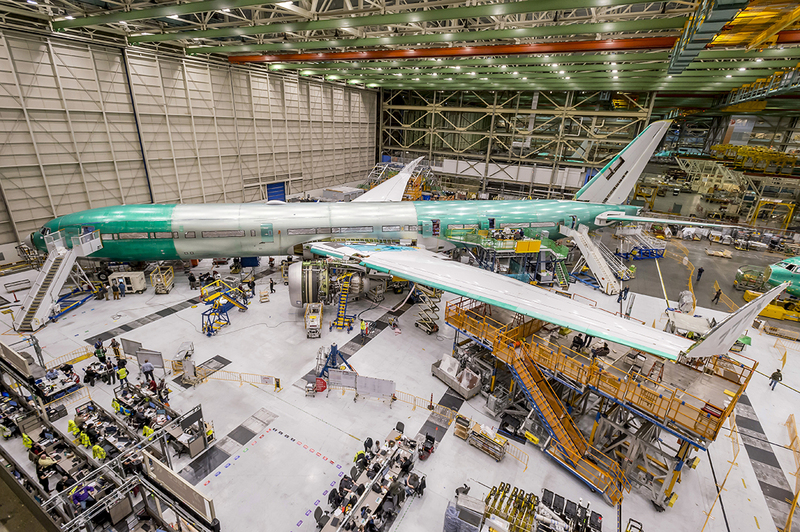 The design of the 777X is to achieve more with less. We reveal how this is done below. The Boeing 777-9 is larger and heavier than the 777 variant it replaces, the Boeing 777-300ER. Despite this, the GE9X engines on the 777-9 are specified with 10,00lbf lower maximum thrust than the GE90-115 on the 777-300ER. How does it all work? We reveal how below.